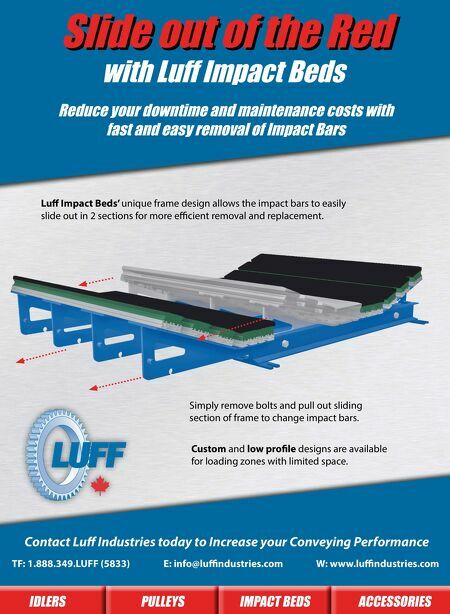 Contact Luff Industries today to Increase your Conveying Performance TF: 1.888.349.LUFF (5833) E: info@luffindustries.com W: www.luffindustries.com ACCESSORIES IMPACT BEDS PULLEYS IDLERS Slide out of the Red Reduce your downtime and maintenance costs with fast and easy removal of Impact Bars with Luff Impact Beds Luff Impact Beds' unique frame design allows the impact bars to easily slide out in 2 sections for more efficient removal and replacement. Custom and low profile designs are available for loading zones with limited space. Simply remove bolts and pull out sliding section of frame to change impact bars.